The Skeptic's Field Guide: Are the Rotary Cartoon Awards fixed? The Annual Rotary Cartoon Awards are said by the organisers to be the premier awards for Australian cartoonists and caricaturists. I have been aware of their claims for a number of years, but I have never tested them. 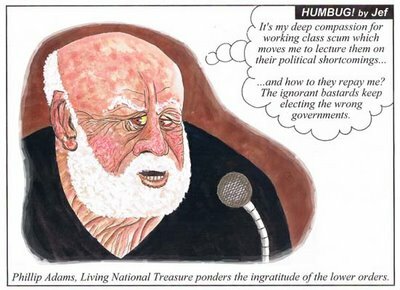 This year I have entered a reworked caricature of Phillip Adams, prominent Australian windbag (the original is vastly better than the scanned version to the left - file size has to be kept down for the blog). If I win an award, clearly the claims of the Rotary people to the prestige of their competion are validated. If I do not win an award, the judges are clearly stupid, corrupt or biased (or even perhaps all three).